When looking at Fiber laser cutting technology and considering the productivity benefits of cutting 2 to 4 times more parts per unit of time, and consuming less than half of the operating costs compared to CO2, it is fairly obvious why Fiber lasers have become so popular. But these are what we consider tangible benefits — benefits based on performance metrics such as speed and cost of operations. 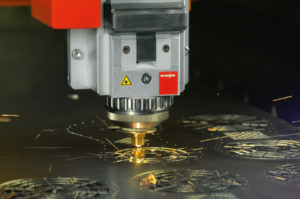 The intangible benefits of Fiber laser cutting technology are derived from the additional machine capacity that is being created. Because you are now able to produce two to three times more parts with Fiber lasers, you have created more machine capacity to cut even more parts. Because you are now more cost competitive with Fiber laser technology, you have the added flexibility to expand into industries you were previously unable to compete in. Intangible profits are also derived directly from the additional machine capacity and the lower overall costs that are realized by not having to perform maintenance tasks typical of a CO2 laser. Not having to perform maintenance on optics, the beam path bellows and purge system, the vacuum pump and other related tasks frees up more machine capacity. Not having to wait 10 minutes until the Fiber laser is at full operating potential on a daily basis is another capacity opportunity gained. The fact that the beam alignment and the beam size never change on the Fiber laser facilitates consistency of cut and repeatability of parameters on a daily basis. This benefit increases machine capacity by not having to spend time tweaking the parameters because the parts are always consistent in cut quality from shift to shift and from day to day. In order to evaluate new Fiber laser cutting capabilities correctly, it is important to study how they apply in your production. Often engineers are tasked with finding the technical specifications for each of the competing machines and collecting them on a spreadsheet. Feed rate charts are typical specifications in determining speeds, but they do not tell the entire story in terms of overall productivity gains. Why don’t feed rate charts tell the entire story? Missing is critical machine dynamic criteria such as acceleration and deceleration during positioning and cutting, as well as piercing times, which are very important to the end result. Yes, feed rates are important but only where the machine reaches full speed depending on the length of the line segment or the size of the feature. Increasing the feed rate in small features or in short distances that require constant deceleration and acceleration does not affect the overall times because the maximum feed rate is never achieved. Having a higher accelerating motion system will provide you with the ability to reach the speeds in a much shorter distance and will shorten the overall part time. When cutting long line segments, the feed rate is achieved. The overall evaluation of Fiber laser cutting machinery productivity is best validated through a time study initially and then confirmed with a live demonstration. Not only should studies incorporate feed rates but they should also include all of the different aspects of machine dynamics and laser technologies that have been incorporated into that specific machine. Seeing the machine in action and confirming the real productivity gain is the only way to validate the effectiveness of new equipment. Ensuring that the time studies match the actual times will also ensure that your future job bids can be met with confidence in quoting. When considering Fiber lasers evaluate both the tangible and the intangible benefits. When creating cost justifications include both tangible and intangible benefits, albeit the tangible benefits will already be an eye opener. Be prepared for the additional machine capacity and consider expanding into industries that you were previously unable to compete in. Validate your supplier’s time study estimates and don’t use a feed rate chart as your sole criteria for the initial selection of a supplier as it does not provide the complete picture. Confirm your top choices with a supplier visit to see the machines in action cutting your parts and comparing them against what the supplier time studies had indicated. After evaluating the full potential of Fiber laser technology, you will realize that you can produce 2 to 4 times more parts at half the cost, while simultaneously creating more machine capacity which will enable you to diversify into other markets or win more competitive bids with a lower overall cost per part. The justification needs to include both the tangible and intangible benefits to see the complete potential of the fiber laser investment.